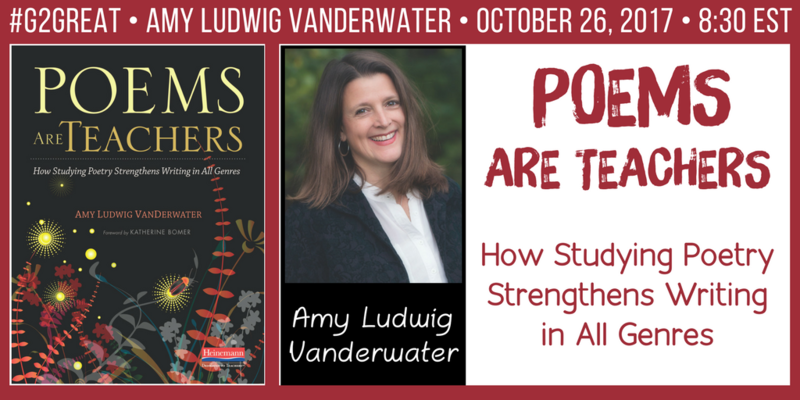 #G2Great was delighted to welcome Amy Ludwig Vanderwater as our guest host on 10/26/17. I am one of many devoted Amy fans, following her heart-warming poetry through her books like Read! Read! Read! and her blog, The Poetry Farm. As soon as our chat began, our incredible group happily gathered together to celebrate her beautiful gift to all educators, Poems Are Teachers: How Studying Poetry Strengthens Writing in All Genres (Heinemann, 2017) – and we accept that gift with absolute gratitude. That sounds like quite a lofty promise, doesn’t it? Well I can assure you that these are not empty words since I personally experienced joy from beginning to end as I read Amy’s amazing book. And that “magic dust” that Katherine told us was sprinkled across the pages of the book? Well, it soon became my personal reader reality. Well my friend, you can officially release your fears because your “poetry legos” are arranged into an array of professional beauty! Amy’s book offers the intricate details that will help each of us transform poems into teachers. Since her book does the heavy lifting, I decided to turn my attention back to Amy’s #G2Great tweets to explore how we could help poets and teachers unite in a shared role as professional partners. As I savored her inspiring messages, five Professional Partnership goals began to emerge. Amy reminds us that our role as reader allows us to step into the writer’s words and experience the beauty of the poem from a personal perspective. When we willingly linger a bit longer in that beauty, we bring those roles together and notice things that we could never have imagined on our own. We have a responsibility to children to allow them to regularly feast upon a lovely banquet of ‘poetry helpings’ so that they too can experience poetry from the inside out. Amy reminds us that we elevate our role as reader by using our voices to bring the poets words to life in an oral rendition informed by how it speaks to us. As we read, we recreate the poem through a personal translation of new meaning using drama and expressive language. This transformation from written to spoken poetry creates new meaning since we have become part of it. And as we read aloud, we invite the writer to stand beside our young listeners as the author’s words and the sound of our voice beckons reading, writing and listening to join forces. An unlimited source of exquisite poetry is everywhere we turn. Each author crafts their unique view of the world through their words. As we openly share these beautiful resources with children, we let our worlds collide – and we are forever changed by this celebratory collaboration. Amy reminds us to share a wide range of poetry to broaden and enrich this view since each piece shows us poetry from a new angle of understanding. We willingly join hands with our mentor poets and welcome them in as our teachers. Once we bring the world of reader and writer together, we can then craft our own view of the world. We do this by making room for children to assume a seat at the writer’s table motivated and supported by the poems we have come to love. Their journey with our mentors inspires children to find just the right combination of words. Amy emphasizes that we need time; time to think, time to explore, and time to reflect. This respect for time also affords children to gather words and ideas so that they can place them lovingly in a notebook where they will eventually find a heart home in a student-created poem. This shared professional journey implores us to bathe children in self-selected reading daily and ensure that poetry is in that mix. We refuse to perpetuate a system of readerly control with levels or scores that restrain us. Rather we offer a ‘no-strings-attached-we mean-it perspective that embraces freedom to explore. By making choice our professional priority, we invite children to make their own discoveries as we fill their head and heart with visions of wonderful we never even dreamed possible. When poets and teachers come together as Professional Partners, we acknowledge our responsibility to children. Just as Katherine made a promise to each of us that Amy fulfilled, we too must make one of our own. There is a price we must pay to do this wonderful work. At a time when our beliefs are being challenged by questionable quick fixes, mandates and dictates, we must have the courage to speak up as we make a conscious choice to do the right thing for children day after day. And so, keep it we will! Amy’s book is definitely a practice in professional partnerships. It feels like a gift of 1000 poets. I love how you structured this reflection of the chat. We need to keep these goals in mind all the time. What a treasure we have in Amy!